HIRE A PROFESSIONAL CARICATURE ARTSIST FOR YOUR EVENT, PARTY OR TRADE SHOW ANYWHERE IN CANADA! 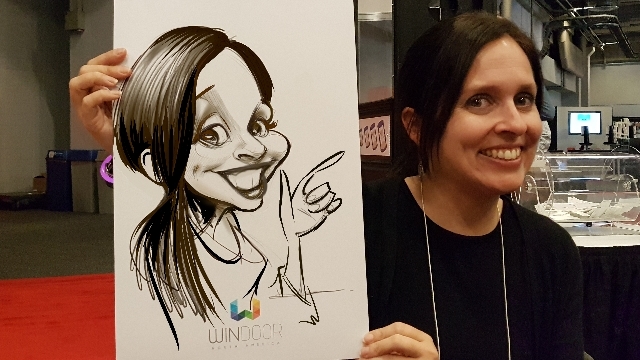 Live caricatures bring laughter and joy to parties, events, trade shows, company meetings, weddings, birthday parties and any other form of gathering. Your guests will leave with a personalized piece of original caricature art. We can set you up with one or more caricature artists anywhere in Canada. Click here to hire a caricature artist. We have been drawing live traditional caricatures and live digital caricatures at parties and trade shows since 1992. Our clients list include several billion dollar corporations such as Coca cola, Nestle and Kraft but we have also been honored to work at hundreds of weddings, bithday parties and anniversaries throughout Canada. We love all and serve all. No client is too big or too small. Wherever you are in Canada you can find and hire a caricaturist from our caricature artists list. All caricature artists in our group have at least 10 years of experience drawing live caricatures at corporate events as well as weddings and family gathering. We have been drawing live traditional caricatures and live digital caricatures at parties and trade shows since 1992. Our clients list include several billion dollar corporations such as Coca cola, Nestle and Kraft but we have also been honored to work at hundreds of weddings, bithday parties and anniversaries throughout Canada. We love all and serve all. No client is too big or too small.